And by "love" I mean experiencing a film on a large screen, with salty popcorn, Diet Coke, sticky floors, noisy crowds and all. In fact, the more crowded the theater, the better. 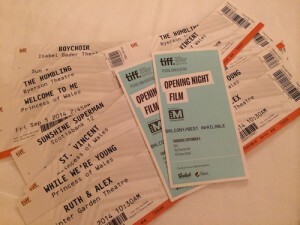 This makes the Toronto International Film Festival one of my favorite experiences ever. Of course the book versions are always better (nothing beats a good imagination), but there's plenty of room underneath the "loved the book" bar for enjoyment. In fact, one of the ways movies can improve a book is with special effects. While "graphic novels" (aka comic books) make fights and explosions colorful, in my oh-so-biased opinion, they don't come close to the enjoyment of the Marvel films which, aside from the witty dialogue, heavily rely on effects (FX- say it fast and you'll get the abbreviation). This has been true for almost as long as films have been around and to prove this point, check out the incredible compilation below. I think my favorite is from 20,000 leagues under the sea. Just classic! And so I salute you FX team for adding so much to the enjoyment of movies. Can't wait to see who wins on Sunday!